We are all moved into our new home in Virginia. There is still work to be done such as painting, hanging pictures and curtains, decorating, etc but almost all the boxes are unpacked which is the important part. The move went really well and the kids handled it better than expected. We stayed with my parents for a week and in a hotel for a week before we actually moved into our new house. Somehow it did not seem to phase the kids. In fact, I am pretty sure Noble loved being in the hotel. He loved going downstairs to a full breakfast, being able to open all the doors in the hotel room, and his special bed we made for him on the floor with couch cushions in his own private room. Since getting settled in the new house, I have been testing out the new oven and it works great. I have several recipes to share with you and I could not wait to share this one. I made this pie to take to my in-laws for the fourth of July and it was incredible! It was devoured and everybody wished we had more. 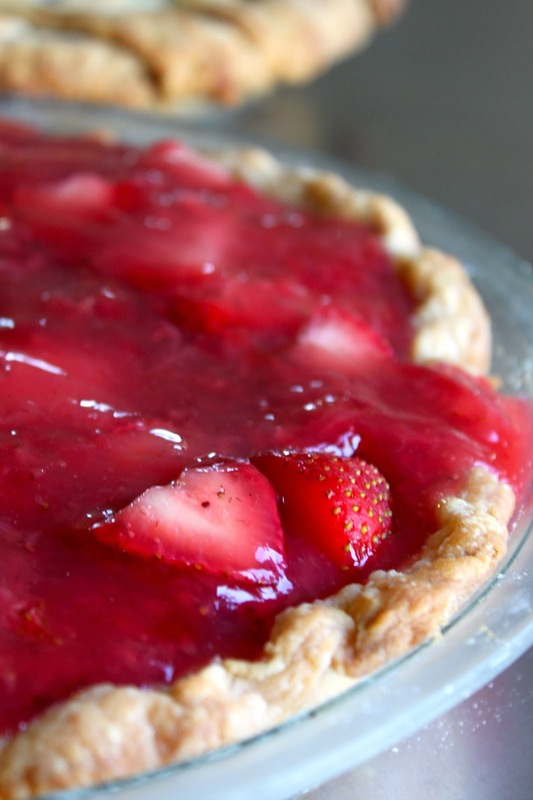 It is super simple and is the perfect summer pie. Place half the strawberries in the baked pie shell. Mash the remaining berries in a medium saucepan with the sugar and vanilla extract. Heat over medium and bring to a boil, stirring frequently. In a small bowl, whisk together the cornstarch and water. Gradually stir cornstarch mixture into the boiling strawberry mixture. Reduce heat and summer until thickened, about 10 minutes, stirring frequently. Pour mixture over berries in pie shell. Chill for several hours before serving.